Heather Orth is Mrs. Lovett and Keith Pinto is Sweeney Todd. Subtitled “The Demon Barber of Fleet Street,” Hugh Wheeler’s book tells the tale of a wrongly convicted man who escapes from an Australian penal colony and returns to London to find his wife. When he hears how she was treated by a lascivious judge, who then adopted their daughter, he vows revenge. Sondheim’s soaring music and his often clever lyrics aren’t easy to master, but Hillbarn has done so thanks to a topnotch cast of singer-actors. She gives him the razors he had left behind so that he can ply his trade as a barber in the room above her pie shop. Because the foppish, fraudulent Pirelli (Jesse Cortez) has recognized him from his past and wants to blackmail him, Sweeney slits his throat. Mrs. Lovett resourcefully decides what to do with the body when she notes that it’s hard to get meat. 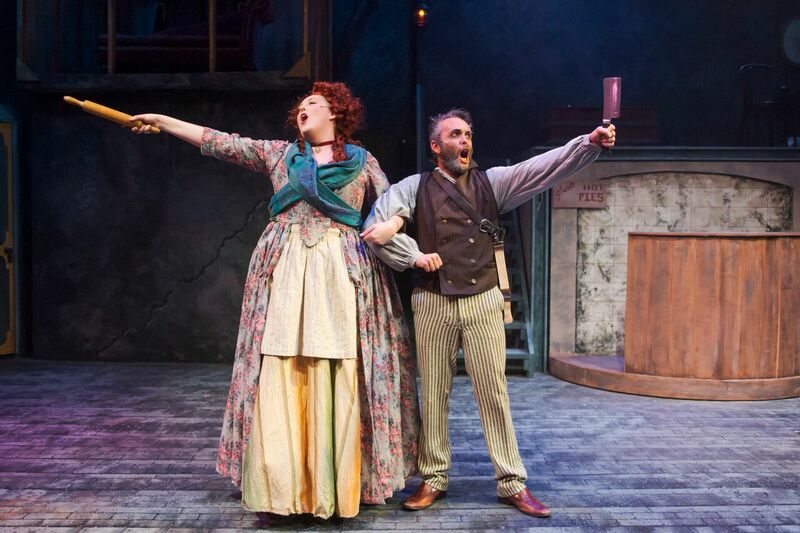 This leads to one of the funniest, cleverest songs in the show, “A Little Priest,” sung by Sweeney and Mrs. Lovett as they gleefully ponder the possibilities that various professions provide her pies. Jaron Vesely is Anthony Hope and Jennifer Mitchell is Johanna. Two other major characters are Anthony Hope (Jaron Vesely), the sailor who befriended Sweeney on the voyage to London; and Johanna (Jennifer Mitchell), the now adult daughter of Sweeney and his wife. They have some of the show’s more beautiful songs, such as “Green Finch and Linnet Bird,” sung by Mitchell in a flawless coloratura; and “Johanna,” sung by Anthony. Completing the stellar cast of principals are Ross Briscoe as the sweet, naïve Toby, who becomes Mrs. Lovett’s assistant; Juliet Green as the crazed Beggar Woman; Samuel Nachison as the officious Beadle; and Chris Vettel as the villainous Judge Turpin. The ensemble is outstanding in both singing and acting. By the end of the show, not many characters have survived, but the audience has been treated to a musical theater masterwork. The show is skillfully directed by Joshua Marx. However, because of Hillbarn’s relatively small stage, he relies too much on the aisles for some scenes. Musical director Rick Reynolds directs the fine orchestra, but it sometimes overpowers the singers. One aspect of the show that differs from most other productions hereabouts is that it’s set in 1785. The Broadway production was set in the mid-19th century. According to artistic director Dan Demers, the original story, which was a serialized penny dreadful in the mid-19th century, was set in the late 18th century. Hence the costumes by Yichuan Sharon Peng are inspired by that time period. They’re especially elaborate for Pirelli and The Beadle. The relatively simple but workable set is by Ting Na Wang with lighting by Pamila Z. Gray and sound by Brandie Larkin. Although this is a first-rate production, Demers wisely stresses in his program notes that it’s not recommended for youngsters under 16. 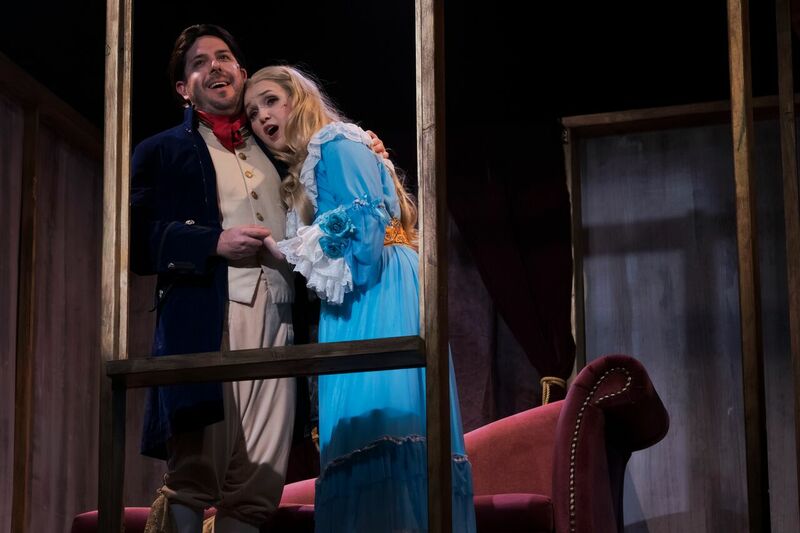 Running just under three hours with one intermission, “Sweeney Todd” will continue through Feb. 10 at Hillbarn Theatre, 1285 E. Hillsdale Blvd., Foster City. For tickets and information call (650) 349-6411 or visit www.hillbarntheatre.org.